On November 7, Charge d'Affaires a.i. 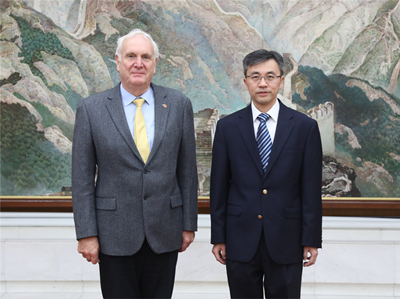 Zhu Qin met with Sir Edward Lister, Non-Executive Director of the Foreign & Commonwealth Office, at the Chinese Embassy and exchanged views with him on the construction of the diplomatic premises in China and the UK. Zhu noted that with the current in-depth development of China-UK relations, both China and Britain are facing the tasks of building or renovating their diplomatic premises. He expressed the hope that the two countries should strengthen communication and coordination in the spirit of mutually beneficial cooperation and offer their support and assistance to each other to ensure the smooth progress of the new premises projects in both countries. Lister said that the renovation and expansion project of the British Embassy in Beijing is one of the key building or renovation projects of the UK’s diplomatic missions overseas. The UK is willing to keep in close communication with China to make sure that their respective projects will make positive progress.